Fayetteville is a fun and unique mix of cool college town, thriving business community, outdoor-lovers mecca and cultural/arts center. We’ve been recognized by Forbes magazine as one of the top five smaller towns to live and work in the country and everyone knows we’re the only place where the Razorbacks run wild. The beautiful and historic city of Fayetteville is the center of everything that happens in Northwest Arkansas. Surrounded by the Ozark Mountains, natural beauty is something you come to expect when you’re here. Fayetteville offers the small-town feel that Arkansas is known for, while always having something exciting going on. Fayetteville is located in Northwest Arkansas, only 25 miles from Missouri and 20 miles from Oklahoma and enjoys 218 days of sunshine per year. How to Use This Handbook? This e-book is written to provide you with a general step-by-step way to open your business in Fayetteville. We have divided this e-book into six main steps that will help transform your idea into an actual enterprise. Step One introduces the Fayetteville Chamber Economic Development team as your point of contact for economic development in the City of Fayetteville. Step Two focuses on explaining detail aspects about zoning compliance and to introduce the City’s Development Services Department. Step Three introduces the various city departments and divisions that you will need to contact to get your site ready for business and in compliance with city ordinances. It also provides information on the HMR (Hotel, Motel, Restaurant) and alcohol tax. Step Four contains important information about utilities and state permits that are necessary for the operation of your business. Step Five contains important information on topics such as the City's Business Registry program, and requirements such as taxes that must be completed at the federal, state, county, and city levels. The last Step includes important information that should be considered when hiring employees. Also included is a section covering other insurance considerations that, depending on your type of business, may be helpful to you. Please note that the information in this e-book may undergo changes from time to time as some of the requirements may change. It is best to verify with the respective offices to obtain the most current and accurate information. 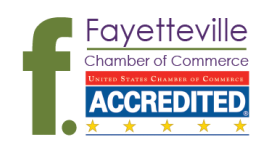 Whether you are considering starting or have decided to start your business, your first stop should be to visit with the Fayetteville Chamber Economic Development team. The team is the point of contact for economic development efforts in the City of Fayetteville. The team functions as a solution provider to prospective entrepreneurs or businesses interested to set up a presence in Fayetteville. When choosing a location to establish your business, you need to consider the zoning and building occupancy requirements in the city. Fayetteville has zoning ordinances and regulations that define how you can use your property. This is common in cities, counties and other local governments that adopt zoning plans and set development standards to ensure that land is used for the common good of the community. Zoning laws come into play on all properties, regardless of size. If you are thinking about leasing or buying property, or making improvements to property you already own, make sure you understand the zoning restrictions before you commit to anything. Additionally, Fayetteville has adopted the International Building Code, which governs the use, construction and occupancy of buildings. The city's Building Official and Fire Marshall can assist you in determining what improvements, if any, are necessary to open your business. So, once you have determined some possible sites for your business, please contact the City's Department of Development Services to be sure you can operate your type of business in that site. Do not sign any lease or sales and purchase agreement until you have checked out the permissible use of the property. This department has several divisions including Animal Services, Building Safety, City Planning, Community Services, and Engineering Divisions. Two of the primary responsibilities of Development Services are managing growth and development within the city and administering and enforcing the ordinances and regulations related to development to achieve a higher quality of life for our citizens. The Department assists with rezoning, large and small-scale developments, subdivision of land, and building permit requests. City Planning also reviews permits for signage, parking, outdoor lighting and architectural design. All businesses operating in the city with a physical address will come into contact with the Development Services Department annually. Businesses must obtain a Business License in order to operate a business in Fayetteville. This is very similar to surrounding cities in Northwest Arkansas. Fayetteville offers an on-line application at a reduced rate. There is also an annual renewal of the business license, all administered through this Department. The license is good from November 1st to October 31st each year. Information on all permit applications and codes can be found online at the city's website. For more information on the Building Safety Division, please click here. The City of Fayetteville Recycling & Trash Collection Division provides for the collection of Trash and Recycling within the City of Fayetteville and offers a variety of services to meet the needs of your business. Services include: commercial trash dumpsters, recycling collection, and large drop box service for the collection of construction or remodeling debris. Please contact the Recycling & Trash Collection Division to discuss options and begin service. Service information can easily be found by clicking here. At this office, you will complete the service agreement and application, post necessary deposits and be brought up to date with the requirements as set in the city ordinances. In addition to meeting with all the divisions under General Contacts, you will also need to visit with the Accounting Division in the City to register your business for HMR Tax purposes if you are in the prepared food business. HMR taxes are collected by restaurants, cafes, cafeterias, delis, concession stands, convenience stores, grocery store restaurants, caterers, and similar businesses. The tax is also levied on hotels, motels and bed and breakfast type of businesses. Currently, the HMR tax is 2% of gross receipts where 1% goes to the Advertising and Promotion fund and the remaining 1% goes to the Parks fund. There are additional city taxes on alcoholic beverages in addition to the state taxes on the same items. If you sell or serve alcohol, you need to apply for an alcohol permit with both the City and the State. You must apply for the state permit before the city permit. For more information and forms, please click here. If you sell or serve alcohol, you will be required to file a supplemental beverage tax report and submit the taxes collected to the city. All the forms and reports may be downloaded from the City’s website. If you are modifying an existing building to accommodate your business, you will need to contact the Development Services Department for assistance in obtaining the proper permits, if any are needed. If you are building a new building for your business, you must also contact the Development Services Department for assistance in understanding the correct process for development through the planning, engineering and construction stages of site development. Please be aware that the process for approval and construction of a new building generally requires much more time from start to completion than occupying an existing building. Fayetteville is served by four companies for telephone, internet, and/or television service—AT & T, Cox Communications, Newroads Telecommunications, and DIRECTV. Cox Communications offers personal and business services including cable television, high speed Internet and Cox digital phone. Calling the Sales Office at (877) 715-5535 will assist new businesses to know of all the possible products, services and discounts available to them. Businesses may also visit their office in Fayetteville at 3390 N Futrall Dr, Fayetteville. Most of Cox services may be ordered online at http://www.buycox.com. DIRECTV offers television and bundles with your local internet and phone services. For more information on its business benefits, products and services, you may visit http://www.direct.tv, and their toll-free phone number is 1-866-271-9853. There are two electrical utility providers in the Fayetteville area. The company to service your business is determined by your business location. This company provides all rural and some city electric service. You may pay your bill online by logging onto your account on its secure website. Ozark customers may pay by credit or debit card or through your checking account. Ozarks Electric may also provide a postage paid envelope to the customer to pay an electric bill. Lastly, customers may pay in person at Arvest Bank, Bank of Fayetteville or Liberty Bank of Arkansas. For more information, please click here. The company is the sole provider of gas service in Fayetteville and surrounding rural areas. Source Gas offers several payment options including Bank Draft Plan, Pay by Phone, Internet or Credit card, service mail or pay at an authorized collection agent. The company offers energy management support to businesses. There are also rebate programs that businesses may qualify to apply. Address: 655 East Millsap Dr., PO Box 13288 Fayetteville AR 72703-1002. The Arkansas Department of Health requires restaurants, food services or food manufacturing, and other types of personal consumption businesses to have permits. The Tobacco Control Board issues specific retail, wholesale and manufacturer’s permits, plus cigarette vending machine permits and stamps. Air pollution, solid wastes, stream pollution, and water quality permits may be obtained from the Arkansas Department of Environmental Quality. All businesses located within the city limits are required to obtain an annual business license. New businesses must register either before obtaining permits for construction or renovation or within 60 days of opening. You may apply online or using hard copies. More information on the Business License and an application for registration may be found here. For corporations, filing an application for a Fictitious Name is made to the Arkansas Secretary of State. Filing may be done online. In general, all businesses need to have an EIN, also known as a federal tax identification number. It is used to identify a business entity. The Internet EIN application is the preferred method for customers to apply for and obtain an EIN. Once the application is completed, the information is validated during the online session, and an EIN is issued immediately. The online application process is available for all entities whose principal business, office or agency, or legal residence (in the case of an individual), is located in the United States or U.S. Territories. The principal officer, general partner, grantor, owner, trustor etc. must have a valid Taxpayer Identification Number in order to use the online application. Begin your application here. Businesses can obtain an EIN immediately by calling the Business & Specialty Tax Line at (800) 829-4933. The hours of operation are 7:00 a.m. – 10:00 p.m. local time, Monday through Friday. An assistant takes the information, assigns the EIN, and provides the number to an authorized individual over the telephone. Businesses can fax the completed Form SS-4 application to (215) 516-3990. If the business fax number is provided, a fax will be sent back with the EIN within four (4) business days. The processing timeframe for an EIN application received by mail is four weeks. Ensure that the Form SS-4 (PDF) contains all of the required information. If it is determined that the entity needs a new EIN, one will be assigned using the appropriate procedures for the entity type and mailed to the taxpayer. Detail information and electronic SS-4 can be found here. In order to operate your business, you are required to pay and collect taxes. The Federal Government and the State Government require you to make the payment of several taxes. Keep in mind that the county where you live in and even the city where your operations are located will ask you to collect taxes for specific businesses as well. Sole proprietorship: You must file IRS Federal Form Schedule C with your personal Federal Income Tax return (Form 1040) and any other applicable forms that help to determine the gains or losses in your business. Partnership: You must file a federal Partnership return (Form 1065). The form shows gross and net earnings of profit and loss. Also, each partner must report his share of partnership earnings on his individual form 1040 based on the information from the K-1 filed with the form 1065. Corporation: You must file a federal Corporation Income Tax Return (Form 1120). You will be required to report your earnings from the corporation including salary and other income such as dividends on your Personal Income Tax Return (Form 1040). Every worker must pay Social Security and Medicare coverage. For the self-employed, the contributions are made through the self-employment tax. Similar to the Federal Income Tax, every business will need to file state income tax, and the forms to use will depend on the structure of the business, such as proprietorship, partnership, LLC, etc. If you purchase inventory or materials that will become part of your products to sell, you will need a Sales Tax Exemption Certificate. This Certificate exempts you from having to pay sales tax to your suppliers. In turn, you are required to charge sales tax to your customers and are responsible to remit those collections to the state. Similar to individuals, businesses are required to assess their real property with the Washington County Assessor’s Office and subsequently pay property tax on them. In addition to real property taxes, businesses also are required to assess personal property (such as vehicles, computers, etc.) that is used in the business and pay personal property taxes on them. There is no city income tax. There is a 2% sales tax for finished products and another 2% HMR tax for finished foods that the City charges. Bringing employees on board to work in your business is an exciting milestone. You’ll want to ensure that you are conducting employment processes in accordance to the laws. Familiarize yourself with federal and state employment and labor laws, including discrimination and harassment, terminations, safe and drug-free work environments, and benefits and wages. The following information will help you understand some basic federal and state labor laws you will need to consider when hiring employees. You are required to get each employee's name and Social Security Number (SSN) and to enter them on Form W-2. This requirement also applies to resident and nonresident alien employees. You should ask your employee to show you his or her social security card. You may, but are not required to, photocopy the social security card. Record each new employee's name and social security number from his or her social security card. Any employee without a social security card should apply for one using Form SS-5, Application for Social Security Card. Every employee must provide an employer with a signed withholding exemption certificate (Form W-4) on or before the date of employment. The employer must then submit Form W-4 to the IRS. This form will indicate on the amount of taxes to withhold from the wages of the employees. The withheld taxes are then sent to the IRS. For the Form W-4, click here. Employers are required to withhold state income taxes from wages of employees. A new employer is required to register by completing a registration packet from the Arkansas Withholding Tax Section upon hiring the first employee. Employers are required to remit monthly the full amount withheld from the wages of all employees. For additional information, contact or click here. Similar to the Federal Withholding Tax, employers must withhold social security and Medicare taxes and remit them to the IRS on a periodic/quarterly basis. On an annual basis, employers must report to the federal government wages paid and taxes withheld for each employee. This report is filed using Form W-2 Wage and Tax Statement. Employers must complete a W-2 Form for each employee to whom they pay a salary, wage or other compensation. Employers must send Copy A of Form W-2 to the Social Security Administration (SSA) by the last day of February (or last day of March if you file electronically) to report the wages and taxes of your employees for the previous calendar year. In addition, employers should send copies of Form W-2 to their employees by Jan. 31 of the year following the reporting period. A business with no previous employment record in Arkansas is taxed at 3.6% on the first $10,000 of each employee's earnings until an employment record is established, usually three to five years. The tax is determined by past experience and the amount of the reserve-ratio. The reserve-ratio is the excess of contributions paid over benefits charged as related to payroll. The higher the reserve-ratio, the lower the tax ratio. Property insurance covers everything related to the loss and damage of company property due to a wide-variety of events such as fire, smoke, wind and hail storms, civil disobedience, and vandalism. The definition of "property" is broad, and includes lost income, business interruption, buildings, computers, company papers and money. Property insurance policies come in two basic forms: (1) all-risk policies covering a wide-range of incidents and perils except those noted in the policy; (2) peril-specific policies that cover losses from only those perils listed in the policy. Examples of peril-specific policies include fire, flood, crime, and business interruption insurance. All-risk policies generally covers risk faced by the average small business, while peril-specific policies are usually purchased when there is high risk of peril in a certain area. Consult your insurance agent or broker about the type of business property insurance best suited for your small business. Business owners providing certain services should consider having professional liability insurance (also known as errors and omissions insurance). This type of liability coverage protects your business against malpractice, errors, and negligence in provision of services to your customers. Depending on your profession, you may be required by your state government to carry such a policy. For example, physicians are required to purchase malpractice insurance as a condition of practicing in certain states. Contrary to popular belief, homeowners' insurance policies do not generally cover home-based business losses. Depending on risks to your business, you may add riders to your homeowners’ policy to cover normal business risks such as property damage. However, homeowners’ policies only go so far in covering home-based businesses, and you may need to purchase additional policies to cover other risks, such as general and professional liability. Nearly every business has key employees who are critical to the overall success and profitability of the business. Key employee life insurance is insurance on the life of a key employee, purchased to reimburse an employer for the economic loss caused by the death of the employee. As such, key employee life insurance is not a specific type of life insurance policy; rather, it is an effective way for a business entity to use life insurance. Business owners purchase general liability insurance to cover legal hassles due to accident, injuries and claims of negligence. These policies protect against payments as the result of bodily injury, property damage, medical expenses, libel, slander the cost of defending lawsuits, and settlement bonds or judgments required during an appeal procedure.